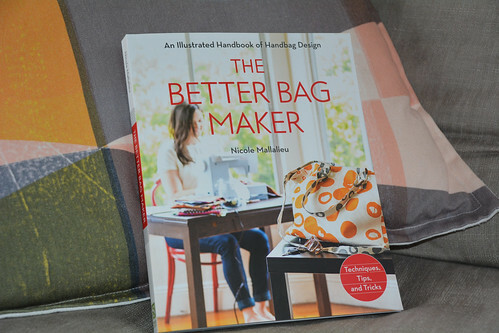 Today I’m kicking off The Better Bag Maker Book Tour and sharing with you not one, but two bags that I’ve made from Nicole Mallalieu’s latest book. Prior to pattern testing these bags for Nicole, my bag making experience was zilch (I’m excluding draw-string bags here!). 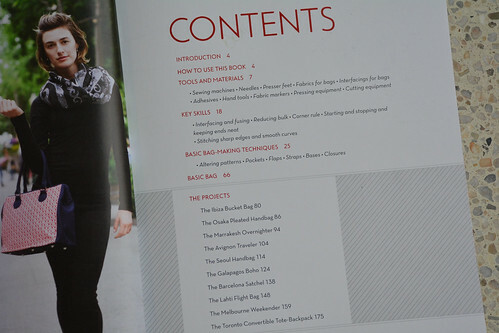 I had a lot to learn, and The Better Bag Maker – An Illustrated Handbook of Handbag Design delivered! 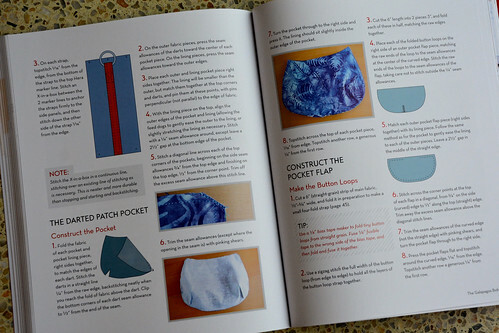 The book is cleverly ordered so that all the tools and materials, key skills and basic bag-making techniques are explained at the beginning of the book. The bag making projects, using information from those early chapters, follow. A full sized pattern sheet is included. The basic bag is the first project and it is the building block from which all the bags in the book are derived. Being a total bag-making novice, I heeded the advice of the author and tackled the basic bag first. The bag is fully-lined, with a zipped pocket, compartments and a magnetic clasp. The basic bag is the perfect size for me. It goes on picnics, to sewing gatherings, knitting machine classes, fabric shopping, kids’ birthday parties and family holidays. It even recently went to school with my eldest daughter when she was star of the week. She used it to carry all her precious treasures to share with her class. You could say this hand-made bag is very much part of our day-to-day life, which is very satisfying on so many levels. For those with eagle eyes and who are already familiar with the book, I incorporated the ‘alternative two-fabric straps’ method in my basic bag as described on page 77. The main fabric for the bag was Lungo d’Arancio from Tessuti. I will confess that when I was on my post-bag-making-high (which I can tell you readers, lasted for quite some time! ), I bought some of the blue colourway to make another basic bag. One of these basic bags in my house just isn’t enough! After the thrill and satisfaction of making my first bag, I decided to up the ante and try one of the more advanced bags in the book. As I mentioned earlier, this is exactly how the book has been designed. There is the basic bag (as above) and then project-by-project the basic bag is modified and new techniques are added. You can pace yourself and work through the projects one-by-one, or jump in at anytime. I ended up diving, rather than jumping, in and tackled one of the intermediate bags in the book. Zippered welt pockets anyone? All jokes aside, it’s pretty amazing that Nicole’s instructions, diagrams and photos can take a novice who’s just made her first basic bag and give her the expertise and confidence to sew The Galapagos Boho with zippered welt pockets, curved patch pockets and an adjustable strap. The lovely people at Stash Books have kindly offered to send an electronic copy of the book to one of my lucky readers. Hip hip hooray! If you’d like to win this copy, just leave a comment below by Monday May 12th @ 5pm AEST telling me about any of your bag making successes, failures, plans or dreams. I’ll randomly draw the winner and pass the details onto the publisher who’ll distribute the prize. If you’re interested in purchasing a hard copy version, it’s available from numerous online bookshops or you can try your local bookstore. My local, Can Do Books, already has it in stock! A kindle version is also available. Disclaimer: I received a hardcopy version of the book from the author as a thank you for my pattern testing assistance. All opinions are my own. My first ever bag making experience was a messenger bag for my son using some offcuts from the local canvas awning shop. The fabric was the. toughest. stuff. ever. It was designed to make an awning that would last on the outside of your house for 20 years! My little Janome and I battled on through bent pins and bleeding fingers (no idea why I still don’t own a thimble). Eventually the bulb blew and I finished the bag at midnight, sewing bias binding in the dark through multiple layers of what seemed like Kevlar. That bag will outlive us all! The blue/grey bag was gifted to a dear friend and it now resides in Germany! I love your ‘first bag’ story. I think using awning canvas goes in the category of ‘it seemed like a good idea at the time’. Hello, all my bag making efforts have been of the very simple variety. I own the book Carry Me by Yuka Koshizen and have made several Azuma bags which are great for carrying knitting projects! I’d love to to check out The Better Bag Maker! It’s always good to start simple Peg. I’m going to check out the book you mentioned. I’m a sucker for all things Japanese! Very impressive bags. I have made a couple of purses but they aren’t things I carry around very often. 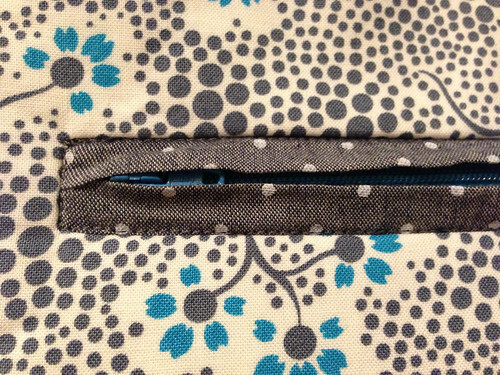 I’d love to learn how to do a zippered welt pocket, that seems like something I would love to have for an exterior phone pocket. My dream is to make the perfect travel purse. One that can hold my camera, wallet, sunglasses and a bottle of water all while looking cool and classy. A tall order I know! 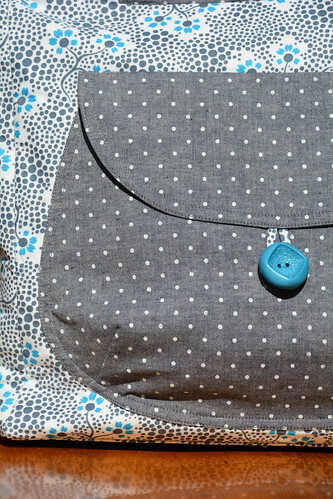 A zippered welt pocket would be perfect for an exterior phone pocket. Good luck with the giveaway. I only dream of making bags…. One of the things that I like about pattern testing is that there is no chance to chicken out. I didn’t realise the second bag had zippered welt pockets until I got to that section in the instructions… and there was no going back. Nikki’s instructions are super clear and detailed. I actually credit her patterns with teaching me to sew! A T-Rex library bag sounds ROARsome! Wow, the grey bag is gorgeous! I haven’t made a bag before, but my college-bound daughter found some cute fabric in my stash and has has asked for one. I do feel a bit intimidated by the hardware that many bags require but it looks like this book might be just what I need. I think this book is just what you need Mel. Fingers crossed you win. Hi Anna, these bags look amazing. The book looks amazing too. I would love to work through the book, making each and every bag. That way, I would gain experience in bag making and have a stash of amazing presents to give to friends. It is an amazing book Diana. Best of luck with the giveaway. I’m learning to sew and set myself the goal of making ten shopping bags from different patterns/tutorials (quite addictive, useful and great gifts) to gain some skills and confidence. Now I’d love to start making some ‘classier’ bags and would love to win this book. thanks for the blog and giveaway. Hi Lynda. That’s a great way to learn to sew. Fingers crossed you win the giveaway. I love your bag. That is a beautiful pocket! I haven’t tried making a “real” bag (drawstring stuff sacks aren’t in the same league) but would like to as it’s hard to buy nice ones that have everything just where you want it. Great giveaway! Thanks Lyndle. You absolutely right, making your own bag means that you can add all the features that you need. Good luck with the giveaway. I did see that there was a Kindle version – how are the patterns dealt with in that situation? Is there a way to print them or a site where they’re available as a download? I’d love to get this book, but I’d prefer the Kindle version just because it’s cheaper (and we’re poor right now). I can’t wait to get my book – still not released!! I have made not one bag but five from Nikki’s pattern called Belle. I love the bag so much that I plan to make a few more in the near future. I have had lots of good comments on the bag wherever I go. Nikki is very talented and her instructions are easy to follow and very clear too. I have been planning to purchase a hard copy soon. I’ve made a Belle too Jeannie and I love it! The books sounds right up your alley! Nice tote! I’m excited about this blog tour! I love how she has included the inside upper lining to matche the exterior fabric of the bag! So many designers forget that this is an important element to the professionalness (is that a word?) of the design! Really like the second bag…I’ve sewn qyuite a few bags and even designed a few of my own, but I’m still looking forward to getting a copy of this book soon. Nikki does seem to think of everything. And professionalness is definitely a word! What a great idea… a sewing book souvenir. My family and I have booked a European/UK holiday in Sept/Oct and I was planning to buy some souvenir fabric… now I’m thinking patterns and books are good options too. Your bags are beautiful … well done. I am a bit of a bag-making-novice having only made my son a library bag. Heaps of fun but I just made it up as I went along. This book will definitely be added to my birthday wish list! Your bags are very nice. The blue grey one in particular. I have only ventured into the drawstring bag category. It would be great to move forward! Hi ! 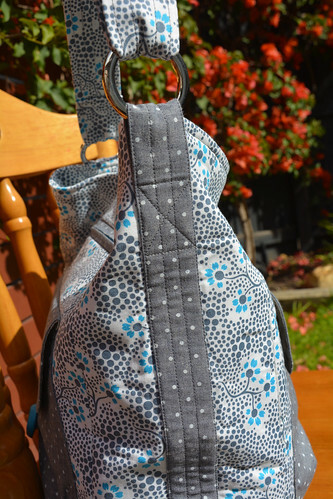 I just started making bags – the “right” way, with interfacing – I am hooked ! Would love to have this resource to continue my education. Great bags. This sounds like the book for me: I have three patterns for bags, one completely cutout fabric and lining and metal clasp all ready to go, and a great fear of …making bags! 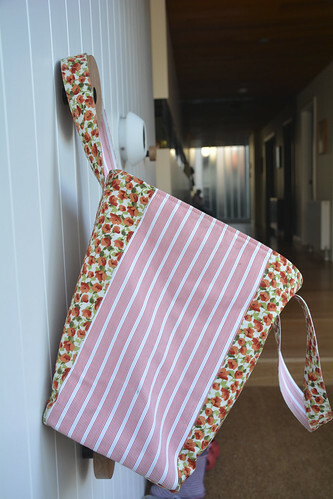 I’ve made a couple of tote bags but I’d love to master zips and flaps and things!! I do like to make bags and always get complements. People love something unique that you only get with homemade! I love your bags 🙂 I have just recently begun sewing in earnest (before that I just dreamed lol) I finished three out of four projects (not bags, but sewing gifts for loved ones) on my plate and actually made myself a Washi dress! Those are huge successes for me so I am very excited to keep sewing. My next project goal is a bag which I really need right now for practical reasons 🙂 so I would love, love, love a copy of this book to teach me to do it right! I love bags and all my efforts have been very difficult and take me a long time to figure out. I am a quilter and find that bags 3D challenge me. I would a book that could help me where I am at. Successes – welt zips & purse feet – yay gotta love them, they make bags look mighty fine. Yep I’m loving a good looking bag. 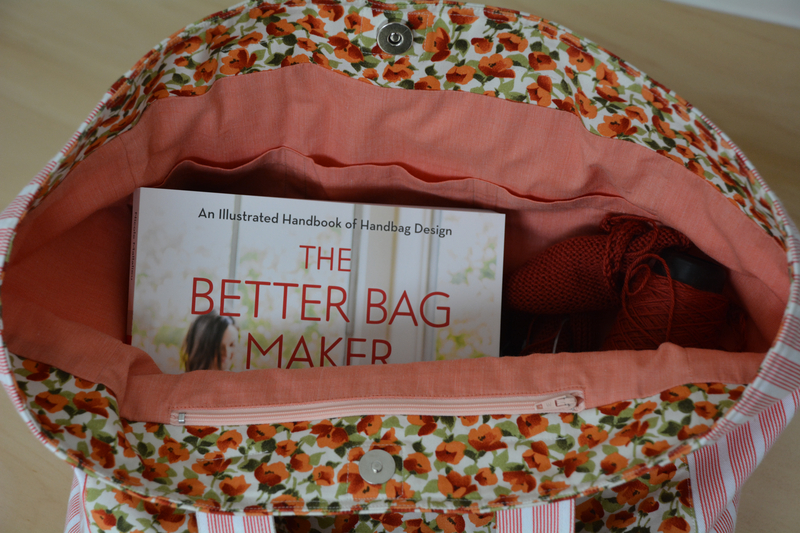 I’ve never made a bag before, so this book would be a blessing! 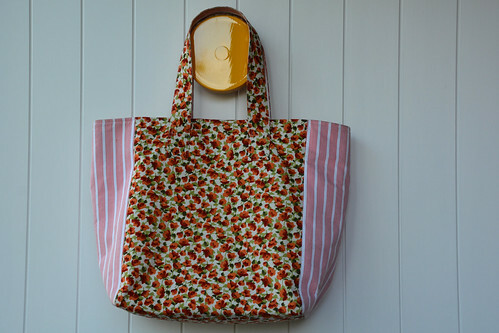 I picture floral and gingham and polka dot fabrics all sewed up beautifully into a bag I would take with me everywhere! Your bags look brilliant. So well finished. YAY! My bag making experience is pretty limited and fairly ordinary. Nothing with zips or closures of the like. Just a tote of two. I need to make bags though – one for the beach, one of sporting trips, one for swimming lessons… maybe if I had a bag for every event I’d be better organised?!?!? FYI – I went ahead and got the kindle version and yes, it does have a link where you can download a .pdf of the patterns! 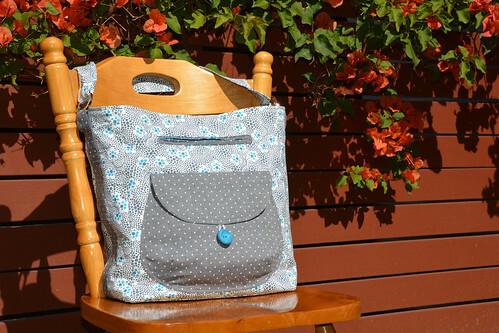 I would love to make some bags as gifts for family…plus also use up my fabric stash! 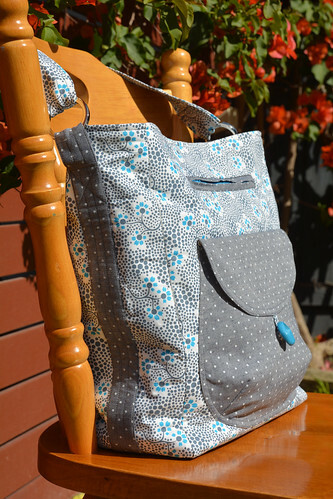 Thanks for sharing your bag making successes! Great looking bags – would love to have the book – know it would inspire me to make one of my own! I am amazed at the wealth of knowledge and detail that Nicole shares, and I love seeing what other people pull together colour wise. I must admit that that is an an area that challenges me, so seeing what others create is helpful. I love the idea of the ebook as there always seems a mess of fabric and tools around my machine obscuring instructions, and invariably do a wrong step. I have made a bag from one of Nicole’s patterns, the panel bag, and can attest to how clearly she explains things! I could love to make a new nappy bag, that looks trendier than a nappy bag! I also have a frame purse kit in my stash that I just haven’t got the courage to do yet! Looks like a great book, I love that bag you made with the big pocket on the front. It;s been literally years since I made a bag, never seem to have the time to do more than mending, sad eh? Congratulations. I’ve made a lot of bags over the years, some better than others! There is always so much more to learn though and I love trying out new designs. The two bags you made look awesome and I can’t believe these were the first ones you’d ever made, well done! Love those bags, the 2nd one is incredible!!! I’d love to work through the book & have Nikki’s guidance step by stepping up my skills – I’ve done small satchels of her’s before but that’s been it in the “real” (structured) bag world for me, though I keep hankering after all the gorgeous handmade bags out there now – I think this book will be my way forward! This is sew exciting and I don’t even know Ms. M. As one recently bitten by the quilted tote bag bug I somehow stumbled into here. Oh, I remember, I had heard about a product that stiffens up a bag/tote real good and went online to look for it for a post on my blog. (I haven’t found it yet). But look what I did find! As one who tends to oversimplify things I am glad to have found out about this book as I am sure what I shall learn will take my bag projects to the next level. I’d like to feature this book on my blog via Amazon Associates. I have been making bags for several years and am note venturing in to masking luggage. There are so many tips and tricks to learn and I think this book would help. Beautiful bag Anna! I made the Day bag at one of Nicole’s classes a few years ago. And got a sample at one of her sales last year. Yes, her instructions are just exemplary. Impressed- that’s all I can say, would take me forever to have a finish like that on a bag, really a must have book for me. That’s a really helpful review Anna – I haven’t laid my hands on a copy of this yet. But I think I need at least one of those basic bags in my life! And I think this may be a good book for the shop. I have found Nicole’s instructions are always so very good and make for a very professional finish. Also – welt zip, most impressive! Lovely to here from you Jane. NZ sounded like an awesome family holiday. And yes, everyone needs a basic bag or two in their life and it would be a great book for the shop.